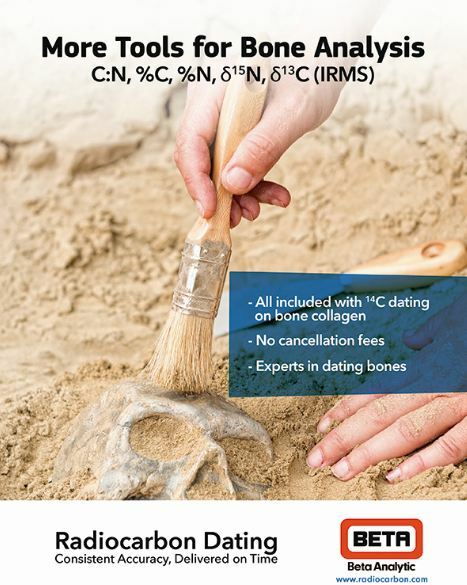 In an effort to further support ​its ​clients’ research, Beta Analytic will provide free d15N measurements on non-cremated bones and d18O on carbonates submitted for radiocarbon dating. The ISO 17025-accredited lab has recently removed its micro-sample analysis fees and cancellation fees for samples that are too small for standard AMS dating. Effective August 18, 2015, radiocarbon dating results for non-cremated bones will include d15N measurements, which are ​usually ​us​ed in the context​ of ​dietary studies. Prior contact is recommended before submitting ​charred or ​burned bones ​because the ​lab may not be able to provide d15N measurements​ for these bone samples, ​depending on the quality​ of the material​. Radiocarbon dating re​ports for carbonates will now ​automatically ​include d18O ​values, which are relevant ​for those working on paleo-temperature ​reconstructions. Beta Analytic’s fees are inclusive of d13C measurements, quality assurance reports, calendar calibration when applicable, and 24/7 web access to past results and pending analyses. The d13C, d15N, and d18O values are measured in an isotope ratio mass spectrometer (IRMS). The lab has recently simplified its pricing structure by removing cancellation and partial analysis fees for samples that are too small or do not provide adequate carbon for accelerator mass spectrometry (AMS) dating. With advancements in the laboratory, samples containing as little as 100 micrograms of carbon or less may be analyzed using Beta’s standard laboratory practices. Beta Analytic provides technical consultation at no extra charge to researchers who have doubts about the suitability of their samples. Submitters are welcome to contact the lab before, during, and after the analysis to take advantage of their expertise. Client support is available in English, Chinese, French, German, Korean, Italian, Japanese, Portuguese, and Spanish. Miami-based Beta Analytic is a dedicated radiocarbon dating lab with standard turnaround time of 14 business days. Expedited services are available (2-6 business days). All analyses are performed in-house; Beta Analytic does not engage in satellite dating. Results are accessible 24/7 via web and mobile access. The lab is respected worldwide for accuracy and customer care. It has international forwarding facilities in Europe, Japan, China, Australia, Brazil, Korea, and Taiwan. Beta Analytic can provide estimates in major currencies including EUR, GBP, JPY, KRW, RMB and USD. Please indicate this information when you request for a price list or quotation. For questions or clarifications, contact Beta Analytic. This entry was posted on Monday, August 24th, 2015 and is filed under Uncategorized .